Anyone involved in trade law knows the time-consuming nature of obtaining primary source material and consulting each of the main trade laws. 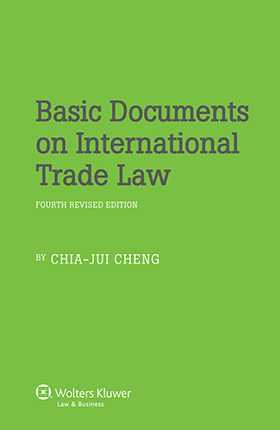 Now in its fourth edition, Basic Documents in International Trade Law solves this problem by assembling, in a single, easy-to-use resource, a very comprehensive collection of the most important and frequently used documents on the law of international trade. In addition to its obvious practical value, this work reveals much about the process of harmonization in international trade law and the operation of the key international trade bodies. This makes the book a helpful reference for international business lawyers, researchers, legislators and government officials in the field. Since the successful publication of the previous editions of the book, the appearance of new conventions and model laws has considerably enriched the law of international trade, and the present edition contains a wealth of new material. The book has been substantially revised and several new instruments have been included. Among the most significantly important improvements to this new edition are new chapters added to different parts of the book, a redesigned and thoroughly revised Part 6 reflecting the expansion of intellectual property rights under the framework of treaties administered by World International Property Organization, and bibliographies and other research resources updated and enlarged to include an extraordinarily rich collection of books and articles in many trading languages besides English, including, for the first time, major Chinese works in the international trade law field. As the late Prof. Clive M. Schmitthoff commented on the first edition, the book ‘is not only of practical usefulness but has also considerable jurisprudential value’, and ‘reveals the methodology of the harmonization process in the area of international trade law’. The International Business Lawyer first commented in 1987 that the book ‘can only be described as a “vade mecum” for every international business lawyer’, an assessment that now seems more merited than ever. International Treaties and Other Instruments Concerning International Trade Law. PART II The Law of the International Sale of Goods. Chapter I The Law of the Contract of International Sale of Goods. Chapter II The Law of International Commercial Agency. Chapter III The Law of International Commercial Distributorship Contract. Chapter IV The Law of Electronic Commerce. PART III The Law of International Transport. Chapter I The Law of the International Carriage of Goods by Land. Chapter II The Law of the International Carriage of Goods by Sea. Chapter III The Law of the International Carriage of Goods by Air. Chapter IV The Law of the International Carriage of Goods by Inland Waterway. PART IV The Law of International Payments. Chapter I The Law of International Banking Payment. Chapter II The Law of International Receivable Financing. PART V The Law of International Insurance. Chapter I The Law of International Marine Cargo Insurance. Chapter II The Law of International Air Cargo Insurance. PART VI International Intellectual Property Law. Chapter I The Paris System of Industrial Property Protection. Chapter II The Berne System for the Protection of Literary and Artistic Works. Chapter III The Sui Generis System of Intellectual Property Protection. Chapter IV The WTO System. PART VII The Conflicts of Law in International Trade. PART VIII The System of Extrajudicial Dispute Settlement in International Trade. Chapter I International Commercial Conciliation. Chapter II International Commercial Arbitration. Bibliographic and Research Resources of International Trade Law.